Just volunteering was not enough for Deirdre Burnett. 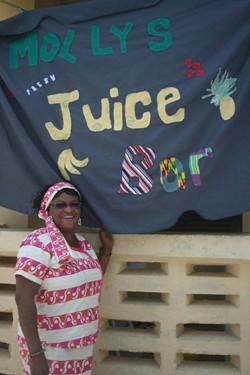 She visited Ghana for the second time in September 2010, this time to set up a juice bar in Cape Coast. The juice bar was made to be a ‘volunteers’ hub’, a common meeting place for the volunteers to relax and catch up with others. Deirdre first came to Ghana back in October 2009 and it left such a big impression on her that it made her want to come back and help even more. She came back and made a fresh juice bar, where the volunteers could meet, hold quizzes, hold Ghanaian cooking classes and there is also a clothes washing facility for those finding it hard to get to grips with the hand-washing culture in Ghana. The juice bar is located in her former host family’s house, the home of legendary Projects Abroad host mum - Molly Yankey. All the profit will go towards the building of extra class rooms at Molly’s Lady Heike School. While Deirdre was out there, she also donated a large amount of second-hand clothes to the children in the school. A documentary was made of about this and is due to be aired on TV in the United States very soon. The staff members in Cape Coast continue to work hard and organize events at the juice bar to raise funds to go towards the school. Projects Abroad would like to say a massive thank you to Deirdre and the staff members for working so hard to make this happen.